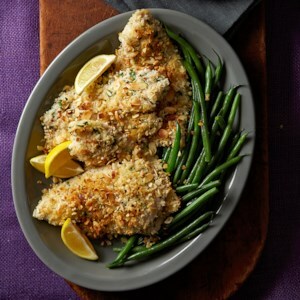 Mild-tasting sole is mixed with thyme, seafood seasoning, and Greek yogurt, coated with a panko crust, and served with a fresh-tasting lemony yogurt sauce in this easy baked fish cake entree. 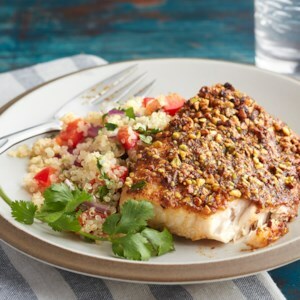 These delicious tilapia fillets are topped with an easy herb and mushroom sauce and can be on your table in just 30 minutes. 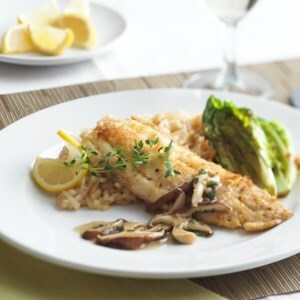 If you have an extra 15 minutes, try our Caramelized Onion Risotto (see associated recipe) which beautifully rounds out this meal. 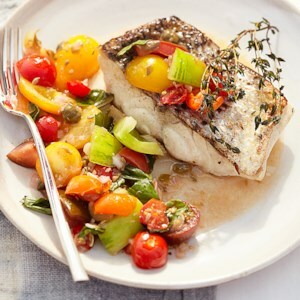 When shopping for fresh tilapia or other fish fillets, look for moist, cleanly cut fillets with a sweet, not fishy, aroma. 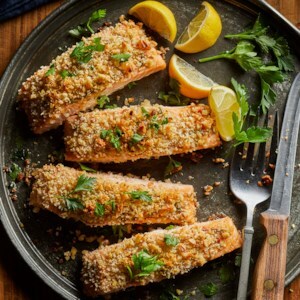 This recipe is a fish cake makeover--instead of forming into patties and sautéeing or frying in a pan, we combine the salmon with protein-packed quinoa and bake it in muffin cups. 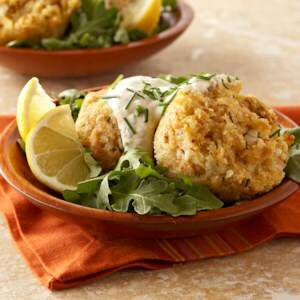 You'll love the lemon-mustard sauce that accompanies these savory muffins. 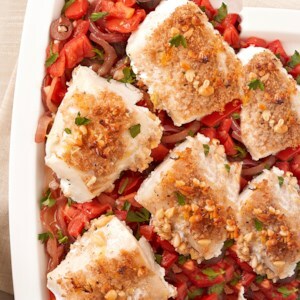 Caramelized red onions, fresh roma tomatoes, and briny Kalamata olives combine to form tasty base for the pine nut-crusted fish in this easy dinner recipe. 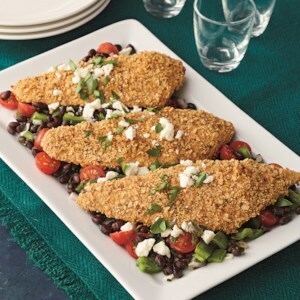 This recipe is a fun and eye-catching way to serve tilapia fillets. 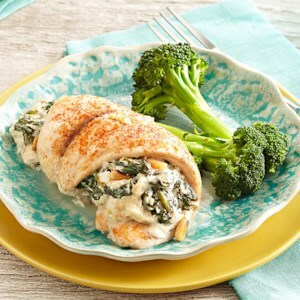 Stuffed with a mouthwatering mixture of fresh spinach, creamy goat cheese, Greek yogurt, and lemon zest, each bite of these stuffed tilapia rolls is guaranteed to please everyone at your table. 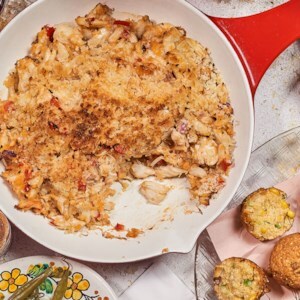 Instead of weighing down fresh crab with a lot of breadcrumbs, this lighter version of deviled crab gets just a sprinkle of them on top for crunch. 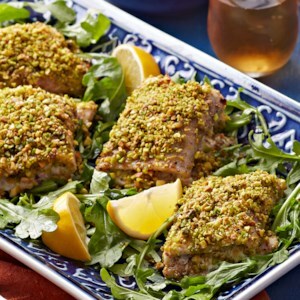 If you prefer, steam 8 pounds of live blue crabs and pick out the meat to make the filling. 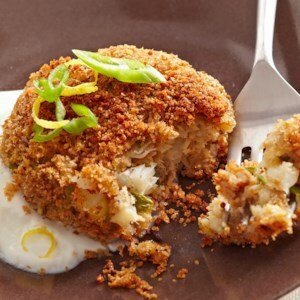 For a really cool presentation, scrape out the shells, fill with the crab mixture and bake as directed. 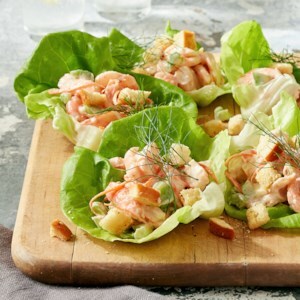 You can scoop it up with crackers or just eat it as is to allow the crab to shine. 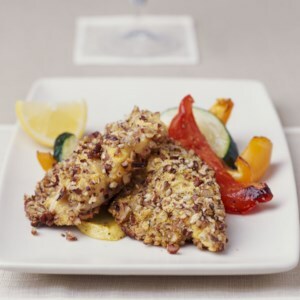 In this quick dinner recipe, fresh tilapia fillets are dipped in a buttermilk-panko coating, sprinkled with almonds and Parmesan, drizzled with melted butter and red pepper and baked until flakey. It may sound complicated, but it takes just 20 minutes from start-to-finish! 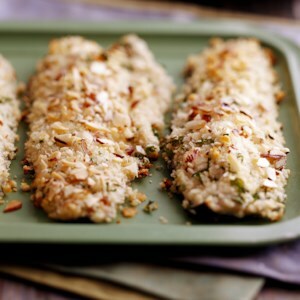 Salmon and walnuts are both great sources of omega-3 fatty acids. 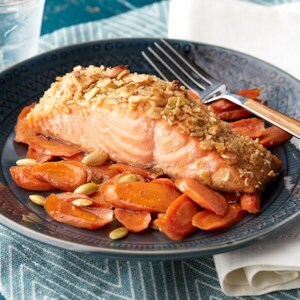 Pair this easy salmon recipe with a simple salad and a side of roasted potatoes or quinoa. 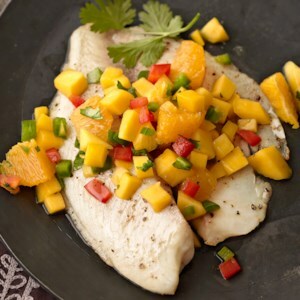 Mild tilapia filets are marinated in an orange-cayenne pepper mixture in this sweet and spicy fish recipe. 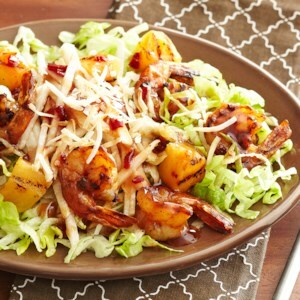 And because spice is nice--chopped jalapeños are added to the fruit salsa to kick it up the heat just a bit more. 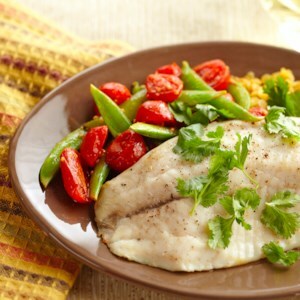 Serve over brown rice to round out the meal.